This is why they say huskies are stubborn! They're very smart but they have low motivation to please their owners. Zeus loves playing in the water in the bathtub and wants the water turned on. Even though it's time for his walk he howls in protest because he wants to play in the water! NOTE: Huskies are extremely intelligent, however, this dog isn't as eager to please her humans as other breeds, which makes her more challenging to train. Huskies do best with experienced, knowledgeable owners who insure they are continually socialized and trained throughout their lives. 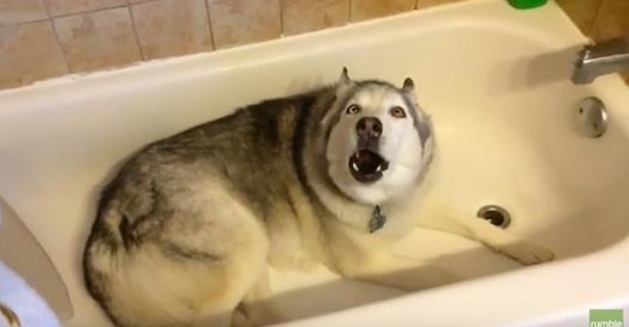 Responses to "Howling Husky Begs To Stay In The Bathtub "